The Illustrated Man is a 1951 book of eighteen science fiction short stories by Ray Bradbury including Zero Hour, a fanciful story about a Planet-wide Invasion launched with the help of brainwashed children under the age of 9. An ABC television series, The Whispers, is airing this summer based on the story, and many of the names are retained. The TV series has an "illustrated man" character. If it goes on to future years, perhaps they will follow the book and pick up on different stories. I am sure that many forum members have read this book. What was your favorite story? 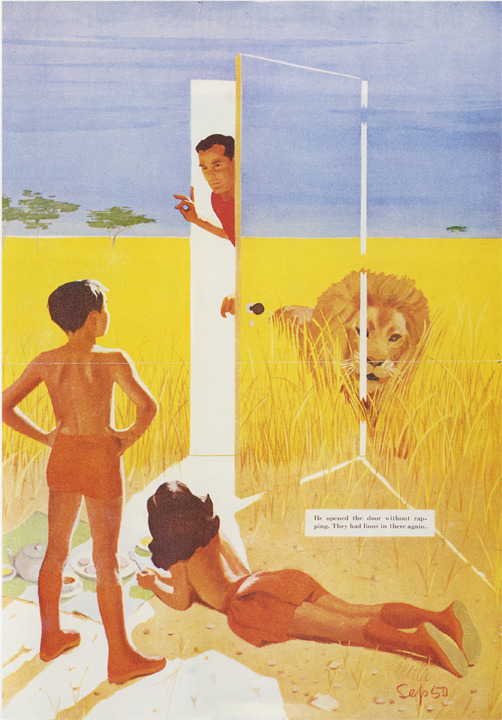 "The Veldt" about 3D high definition television I remembered the most vividly. OH, IT was to be so jolly! What a game! Such excitement they hadn’t known in years. The children catapulted this way and that across the green lawns, shouting at each other, holding hands, flying in circles, climbing trees, laughing. Overhead the rockets flew, and beetle cars whispered by on the streets, but the children played on. Such fun, such tremulous joy, such tumbling and hearty screaming. Mink ran into the house, all dirt and sweat. For her seven years she was loud and strong and definite. Her mother, Mrs. Morris, hardly saw her as she yanked out drawers and rattled pans and tools into a large sack. “The most exciting game ever!” gasped Mink, pink-faced. “Stop and get your breath,” said the mother. “But don’t dent them,” said Mrs. Morris. “Invasion!” said Mink. The door slammed. In every yard on the street children brought out knives and forks and pokers and old stovepipes and can openers. It was an interesting fact that this fury and bustle occurred only among the younger children. The older ones, those ten years and more, disdained the affair and marched scornfully off on hikes or played a more dignified version of hide-and-seek on their own. Meanwhile, parents came and went in chromium1 beetles. Repairmen came to repair the vacuum elevators in houses, to fix fluttering television sets or hammer upon stubborn food-delivery tubes. The adult civilization passed and repassed the busy youngsters, jealous of the fierce energy of the wild tots, tolerantly amused at their flourishings, longing to join in themselves. Twelve-year-old Joseph Connors ran up. “Go away,” said Mink straight at him. “I wanna play,” said Joseph. Joseph showed reluctance and a certain wistfulness. “I want to play,” he said. Joseph walked off slowly. He kept looking back, all down the block. Mink was already busy again. She made a kind of apparatus with her gathered equipment. She had appointed another little girl with a pad and pencil to take down notes in painful slow scribbles. Their voices rose and fell in the warm sunlight. All around them the city hummed. The streets were lined with good green and peaceful trees. Only the wind made a conflict across the city, across the country, across the continent. In a thousand other cities there were trees and children and avenues, businessmen in their quiet offices taping their voices, or watching televisors. Rockets hovered like darning needles in the blue sky. There was the universal, quiet conceit and easiness of men accustomed to peace, quite certain there would never he trouble again. Arm in arm, men all over earth were a united front. The perfect weapons were held in equal trust by all nations. A situation of incredibly beautiful balance had been brought about. There were no traitors among men, no unhappy ones, no disgruntled ones; therefore the world was based upon a stable ground. Sunlight illumined half the world and the trees drowsed in a tide of warm air. Mink’s mother, from her upstairs window, gazed down. The children. She looked upon them and shook her head. Well, they’d eat well, sleep well, and be in school on Monday. Bless their vigorous little bodies. She listened. Mink talked earnestly to someone near the rose bush—though there was no one there. These odd children. And the little girl, what was her name? Anna? Anna took notes on a pad. First, Mink asked the rosebush a question, then called the answer to Anna. “How you spell it?” asked Anna. “T-r-i——” spelled Mink slowly, then snapped, “Oh, spell it yourself!” She went on to other words. “Beam,” she said. “Well, hurry, hurry!” cried Mink. Mink’s mother leaned out the upstairs window. “A-n-g-1-e,” she spelled down at Anna. “Oh, thanks, Mrs. Morris,” said Anna. “Certainly,” said Mink’s mother and withdrew, laughing, to dust the hail with an electro-duster magnet. The voices wavered on the shimmery air. “Beam,” said Anna. Fading. At lunch Mink gulped milk at one toss and was at the door. Her mother slapped the table. “You sit right back down,” commanded Mrs. Morris. “Hot soup in a minute.” She poked a red button on the kitchen butler, and ten seconds later something landed with a bump in the rubber receiver. Mrs. Morris opened it, took out a can with a pair of aluminum holders, unsealed it with a flick, and poured hot soup into a bowl. Mink banged away at the soup. “Who’s Drill? What a peculiar name,” said Mom. “You don’t know him,” said Mink. “A new boy in the neighborhood?” asked Mom. “He’s new all right,” said Mink. She started on her second bowl. “Which one is Drill?” asked Mom. “Martians invading Earth. Well, not exactly Martians. They’re—I don’t know. From up.” She pointed with her spoon. “And inside,” said Mom, touching Mink’s feverish brow. “I imagine.” Mrs. Morris hid her mouth behind her hand. “We’re impregnable2,” said Mom in mock seriousness. “A fifth column,” said Mom. “No wonder. We’re pretty darn strong.” Mom laughed, cleaning up. Mink sat there, staring at the table, seeing what she was talking about. “Well!” said Mrs. Morris brightly. “Do I have to take a bath?” growled Mink. “Drill says I won’t have to take baths,” said Mink. “Drill says you’re dangerous. Know why? ’Cause you don’t believe in Martians! They’re going to let us run the world. Well, not just us, but the kids over in the next block, too. I might be queen.” She opened the door. “He mentioned that,” said Mink. “And what’s im-pres-sionable4?” It took her a minute to say it. At four o’clock the audio-visor buzzed. Mrs. Morris flipped the tab. “Hello, Helen!” she said in welcome. “So do you. The children. Underfoot,” said Helen. “What’s wrong, Mary?” asked Helen. She flung the yo-yo down its string. Reaching the end it— It vanished. “See?” said Mink. “Ope!” Dibbling her finger, she made the yo-yo reappear and zip up the string. “Do that again,” said her mother. “Can’t. Zero hour’s five o’clock! ’By.” Mink exited, zipping her yo-yo. “You’re not impressionable,” said Mrs. Morris. The hour drowsed by. The day waned. The sun lowered in the peaceful blue sky. Shadows lengthened on the green lawns. The laughter and excitement continued. One little girl ran away, crying. Mrs. Morris came out the front door. The ring of children drew in around Mink where she scowled at her work with spoons and a kind of square-shaped arrangement of hammers and pipes. “There and there,” murmured Mink. “What’s wrong?” said Mrs. Morris. “All right. I’ll call you for your bath in half an hour. I’m tired of watching you. She went in and sat in the electric relaxing chair, sipping a little beer from a half-empty glass. The chair massaged her back. Children, children. Children and love and hate, side by side. Sometimes children loved you, hated you—all in half a second. Strange children, did they ever forget or forgive the whippings and the harsh, strict words of command? She wondered. How can you ever forget or forgive those over and above you, those tall and silly dictators? Time passed. A curious, waiting silence came upon the street, deepening. Five o’clock. A clock sang softly somewhere in the house in a quiet, musical voice: “Five o’clock—five o’clock. Time’s a-wasting. Five o’clock,” and purred away into silence. Mrs. Morris chuckled in her throat. Zero hour. A beetle car hummed into the driveway. Mr. Morris. Mrs. Morris smiled. Mr. Morris got out of the beetle, locked it, and called hello to Mink at her work. Mink ignored him. He laughed and stood for a moment watching the children. Then he walked up the front steps. She strained forward on the edge of the chair, listening. The children were silent. Too silent. “I don’t know.” She got up suddenly, her eyes widening. She was going to say something. She stopped it. Ridiculous. Her nerves jumped. “Those children haven’t anything dangerous out there, have they?” she said. She walked to the kitchen. The buzzing continued. “Just the same, you’d better go tell them to quit. It’s after five. Tell them—” Her eyes widened and narrowed. “Tell them to put off their Invasion until tomorrow.” She laughed, nervously. The house shook with dull sound. There were other explosions in other yards on other streets. Involuntarily, Mrs. Morris screamed. “Up this way!” she cried senselessly, knowing no sense, no reason. Perhaps she saw something from the corners of her eyes; perhaps she smelled a new odor or heard a new noise. There was no time to argue with Henry to convince him. Let him think her insane. Yes, insane! Shrieking, she ran upstairs. He ran after her to see what she was up to. “In the attic!” she screamed. “That’s where it is!” It was only a poor excuse to get him in the attic in time. Oh, God—in time! Another explosion outside. The children screamed with delight as if at a great fireworks display. They tumbled into the attic. She slammed the door, locked it, took the key, threw it into a far, cluttered corner. She was babbling wild stuff now. It came out of her. All the subconscious suspicion and fear that had gathered secretly all afternoon and fermented like a wine in her. All the little revelations and knowledges and sense that had bothered her all day and which she had logically and carefully and sensibly rejected and censored. Now it exploded in her and shook her to bits. Below them, Mink’s voice. The husband stopped. There was a great universal humming and sizzling, a screaming and giggling. Downstairs the audio-televisor buzzed and buzzed insistently, alarmingly, violently. Is that Helen calling? thought Mrs. Morris. And is she calling about what I think she’s calling about? Footsteps came into the house. Heavy footsteps. Heavy feet. Twenty, thirty, forty, fifty of them. Fifty persons crowding into the house. The humming. The giggling of the children. “This way!” cried Mink, below. Heavy footsteps, heavy, heavy, very heavy footsteps, came up the stairs. Mink leading them. “Mom?” A hesitation. “Dad?” A waiting, a silence. Footsteps. A little humming sound. The attic lock melted. The door opened. Mink peered inside, tall blue shadows behind her. I also remember loving it. I also hardly remember the stories. The one story I am digging out of my memory concerned a future setting and children able to create a video fantasy to watch and that fantasy was lions eating their parents. Was this story in that book? Its been so long. It vaguely rings a bell. I've read some of Bradbury's work, but overall I don't care much for it (yes, including Fahrenheit 451). I don't think I ever re-read any of his work. His best line is, I think, from an interview: I'm not trying to predict the future. I'm trying to prevent it. The April Witch out loud for a short story class. Was this story in that book? Its been so long. Yes it was. That was "the veldt" that I mentioned earlier. So it made an impression on you as well. The rain continued. It was a hard rain, a Perpetual rain, a sweating and steaming rain; it was a mizzle, a downpour, a fountain, a whipping at the eyes, and undertow at the ankles; it was a rain to drown all rains and the memory of rains. It came by the pound and the ton, it hacked at the jungle and cut at the trees like scissors and shaved the grass and tunneled the soil and molted the bushes. It shrank men's hands into the hands of wrinkled Apes; it rained a solid glassy rain, and it never stopped. The best beginning to any story I have ever seen. Literally writhing a paragraph you are transported to a place of hopeless perpetual rain that has the ability to drown your soul. It takes chapter for most authors, some take much much longer. I've read Something Wicked This Way Comes at least five times. should dig out the books. I too love Bradbury and the stories in that book.